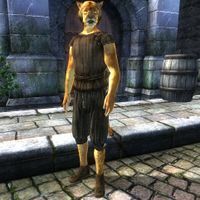 Ra'Jhan is a Khajiit commoner taking great pride in his newly bought house in the expensive Elven Gardens District of the Imperial City. He lives a relaxed existence and spends the majority of the day in his new house. He wakes up at 6am and heads downstairs for six hours of wandering. At noon, he sits down and takes a one-hour lunch. At 1pm he ventures outside, travels to the Market District and spends the entire afternoon strolling around near the crossroads in the center. At 6pm he heads back to his own district and enjoys a two-hour dinner at the King and Queen Tavern until he heads back to his beloved house at 8pm. He spends the rest of the evening on the ground floor and goes to bed at midnight. He will only break off his daily routine on two occasions. Since he was intended to play a role in the unfinished "Imperial Couriers" quest, at midday on the 5th of each month, he will head to the Black Horse Courier and stay there for a brief moment before he resumes his usual schedule, as long as Dervera Romalen is still alive. On the 21st of each month, when the clock strikes midnight, Ra'Jhan skips his bedtime and starts his long journey towards Chorrol. He crosses the Talos Bridge and heads northwest on the Black Road, passing through both Fort Ash and Weynon Priory. After eight hours of walking, he usually enters Chorrol through the southern gate at 8am. Once there, he books himself in at The Grey Mare and spends the next two days hanging out with the regulars. At midnight on the 23rd, he leaves Chorrol and returns to his house in the Gardens. Buying a house in the Imperial City obviously did not drain his fortune completely as he carries a considerable amount of gold. He wears a mixture of lower and middle class clothing, including a belted vest, breeches and a pair of pigskin shoes. He is unarmed and carries a useless key. When you approach him, he will not hesitate to share his enthusiasm about his new life in the Imperial City: "Ra'jhan has a fine house in Elven Gardens. Yes? It costs Ra'jhan many golds. But it is very fine, yes?" When asked about his city of choice he will provide a bit of background information: "Ra'jhan used to share a house, but not now. Ra'jhan is very proud, work so hard, now has house all his own." Though Ra'Jhan's name is spelled with a capital 'J', his dialogue and house references are spelled as "Ra'jhan". Ra'jhan mistakenly has Ra'Jahirr's house key instead of his own house key, rendering him unable to open his bedroom door. Esta página foi modificada pela última vez à(s) 19h29min de 2 de junho de 2015.